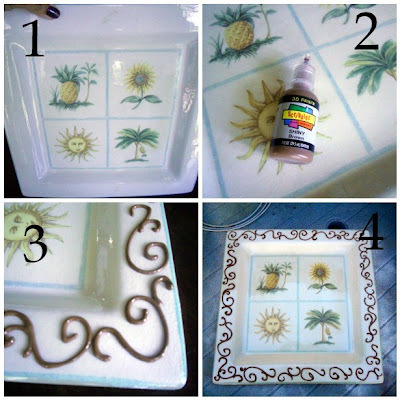 Today I’m going to show you a simple trick to update old plates and platters. While they aren’t food safe, they are great for decorating. You can transform an old plate into a DIY decorative plate for Thanksgiving. Or fall. Or for whatever. 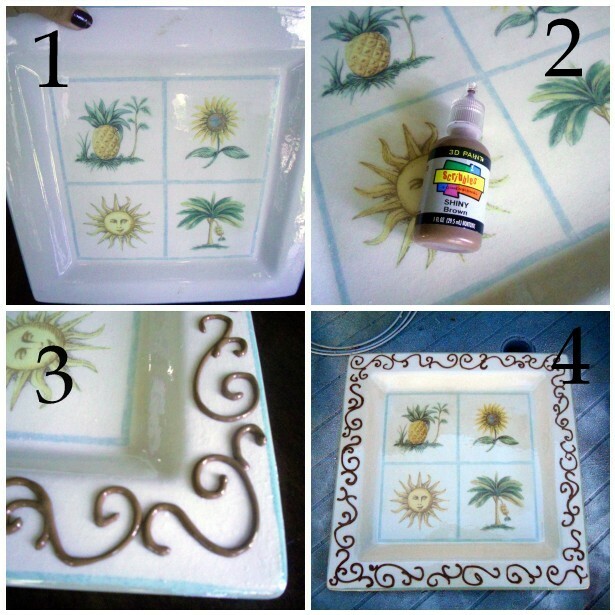 Transform an ugly platter with puff-paint. 1. Take an ugly plate or platter with a cool shape. In this case, a large Williams Sonoma plattter, circa 1997 that I bought at a thrift store for $1. 2. Dig out some 3D scribble (or puff) paint that you have in your craft supplies. (You know you have some… No? OK, then you can pick some up at any craft store for a couple of bucks.) It does not matter what color you choose since you’ll be spray painting it anyway. 4. Let the puff paint dry completely, then take it to an area where you can spray paint it. Spray the entire plate with a plastic primer. Once the primer has dried, spray the entire plate with the color of your choice. When dry, spray the whole thing with a high gloss clear coating. The more coats of the gloss, the more it will look like ceramic. There are a few more coats of gloss that I would like to add. I had originally left it white, with the thought of painting the center with chalkboard paint, or possibly cutting some vinyl with our last name, or “welcome” or a bible verse. The point is, that any ugly old platter can be brought up to date and incorporated into your decor. I opted to spray paint it a warm metallic gold and use contact paper to cut out the words “give thanks” When Thanksgiving is over I can easily change the saying. We should always be giving thanks, November or not. Today, I’m thankful for cooler weather and the chance to be warm and cozy with a fire burning in the fireplace. And I’m also thankful for four strong boys who can bring in firewood for said fire. Vivienne!!!! Freaking LOVE it. I’m gonna try it! Vivienne, absolutely love this! Now I am on the hunt to find a platter!!! What a great idea, one that I wish you had shared before I purged my cabinets and tossed, yes I threw away, old undesirable plates and platters! Thanks for giving me a shout out with your thankful post. It’s been both fun and eye opening doing this again this year. I’m trying to find new things, the not so obvious things, to be thankful for! We have a fire pit in the back yard now, can you send your young strong boys over here to carry and stack some wood for me? I am glad you ran this post again because sometimes I have to read things several times before I pay attention. This is the cutest idea, and puff paint is definitely on my to try list. In my dungeon full of craft and painting items that is one thing I can say I have never had…puff paint. A trip to the craft store may be in order this weekend. Your creativity never ceases to amaze me! I never see stuff the way you do! I love it! I never would’ve thought of that!!! LOVE! I need your boys to come and start my fire!!! Ha! That is so awesomely creative! I would never have thought of that. Ahh great job on transforming this platter! It’s awesome. rad project! I wouldn’t have thought to do something like this…it’s so lovely for the holidays! I can hardly believe this is the same plate. Behold the power of paint! 😀 Thanks for sharing this great idea at Fabulous Friday at Faith, Trust, & Pixie Dust.